HP's business pacesetter tackles high-volume printing with legendary reliability. 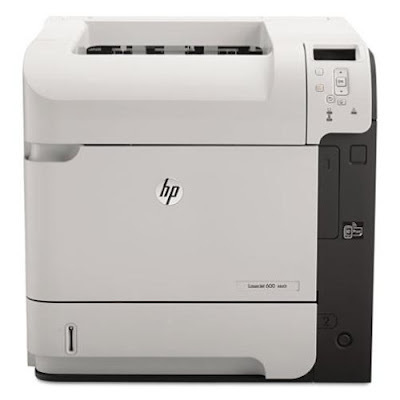 Count on this HP LaserJet Enterprise to help conserve resources, customize printing policies, and improve security. Firstly, this product is very heavy it is a two-person lift so please for the sake of your back plan accordingly, I had a previous (garbage) product from Lexmark which was very similar in function but much lighter in weight. The provided driver installation software on CD is garbage, and doesn't work on some flavors of Win7 and Win8, but that was easily fixed by going online to HP support for this product and just downloading the drivers, when I downloaded the full software setup from that site I essentially got the CD version of the full software support again, which again didn't work. Win8 64 recognized and installed this printer automatically while I was trying to set it up using the HP M601DN CD to install it on Win7 32 bit. You would think that printer manufacturers would test their driver installation software, but, I guess not. I've just had this for a week, but my first impressions is that it a much more useful and reliable product in this class (Mono laserjet, small workgroup printer with duplex and network) than my previous similar product from Lexmark, which turned out to be garbage unreliable with lots of paper jambs, and which Lexmark refused to support, and which had very high cartridge replacement costs. It's fast, it works well, it handles a lot of paper. The only problems I've had relate to restrictions on paper handling that I didn't know about. For instance, the envelope feeder isn't a tray - it takes the place (more or less) of the manual input tray. 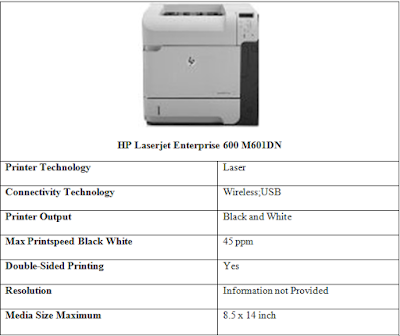 Also, you can only attach a single 1500-page input tray to this HP Laserjet Enterprise 600 printer, it can't handle more than one. Finally, HP ePrint only accepts PDF's up to 5 MB. Most of what I receive and need to print quickly is over that, so it's a bit of a pointless option for me (and it's an unnecessary restriction). M601DN was simple to setup on the network and add as a printer to the domain server and workstations. Prints fast. So far it is working like a charm.